I wasn't going to talk about this DVD until it was released as I was going to get it then. But recent developments have changed that drastically, so instead I'll be talking about the episodes chosen for First Class Stories now. The opinions in this blog post are SOLELY MY OWN. They do not reflect the opinions of the entire Thomas and Friends fanbase. Before I begin, the burning question would probably be "what episodes will be on the DVD?". Well..! I'm not going to focus on my personal opinions of each episodes as my blog posts speak for themselves. But they're as mixed as the fan reaction to the choices. Would I say they were poor? On the whole, no. There are bad episodes there, but there are some really good ones too. But there's one thing this DVD severely lacks: variety. They always say that it's the slice of life, but it seems that didn't reach those who compiled this DVD. Out of all the choices, 15 are animated; 9 were from the last three years alone! How unbalanced is that? If this DVD was really celebrating "exciting" stories from 1984 to the present day, where are series 2 and 5? If you're going to celebrate every generation of the show, where are series 7-12? If they wanted to make a CG compilation DVD, fine. Make one. But don't make one for a big anniversary such as this claiming to celevrate episodes from "1984 to the present day" only to put so much emphasis on the present day, leaving the classic episodes to feel shoehorned in just so they can add that meaningless tagline at the top! In all honesty, that's my biggest problem: there's just no balance. In fact, the way it's been compiled, it feels like they're trying to erase an entire era of the slow while slightly glancing over another. If the kids are going to prefer the CG episodes, fine. But don't completely shield them from what came before; it completely negates choice. In the UK at least, the only way to see classic or new series episodes (series 1-12) are on the complete series collections, which are in very few shops, unless you go online. But the CG series is everywhere: in slops, books, magazines, online, etc. Yes, I love that the show's gone CG, especially with more and more being revealed about future series, but if there's only one choice for kids, they'll have no other option than to love the animated show. Older fans had that choice, and that's really sad. Couldn't have put it better myself. 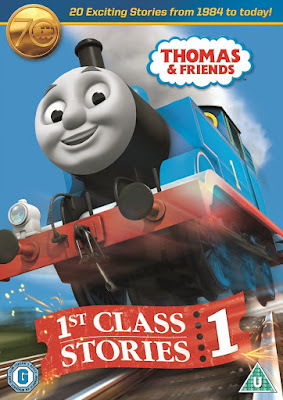 Some extra thoughts I feel are worth noting are two US DVDs - one with a similar theme and problem (The Greatest Stories), and one which succeeded where the other two failed (Engine Friends). The Greatest Stories was a 2010 release, the US version of The Best of Thomas for the UK, and the episode selection was extremely lackluster... and it contained episodes out of seasons 1-11 barring 6! Engine Friends, on the other hand, was released in 2012 in the midst of rubbish CGI DVDs with four episodes... and EF contained 20! It had exclusivity of it's own - unreleased narration on a few episodes and previously unreleased episodes for the US! The bonus features are a bit... meh, but I digress. I don't understand why they couldn't have variety for 1st Class Stories (more like 2nd Class Stories, if you ask me!) when The Best of Thomas (and Friends) contained episodes from every season up to 13. Have they forgotten about variety since then? I mean, what's wrong with including episodes like Edward's Exploit or Best Friends, for goodness' sake (and yes, they're episodes I would've included on the DVD)? I would have chosen the only one, best episode FROM EVERY SERIES. Yes even Series 15. Because, that would have given the DVD title more credit and made it fair across all the eras (Allcroft/Mitton, Grant/Larson, Barlow/Miller, Brenner/McCue). I will purchase this DVD when it comes out anyway, just to see whether it has more than what has met the eye (I mean, you never know...). But I agree that the Episode choices could have been a little better.